The magazine Paris Môme organizes courses of Eastern percussions. A da wor el eykaä (Turn the tempo) you have to turn the rhythm.... The rhythm, Hassan Abdel khalek knows it. With his darbouka,he accompanied around the world the most famous and talented Eastern singers and dancers: Tahiya Karyouca, Nahad Sabri, Fifi Abdou, Aza Cherife, Chouchou Amine! Today, finished the cabarets and the tours. Since 1997, from Monday to Saturday, in his Center of Eastern percussion, Hassan Abdel Khalek explains in his lessons how to play all the rhythmic instruments: Darbouka, Req, Bendir, Sagattes (cymbalettes of the fingers), Bongo, Tabl Baladi (el tabl el saïdi), in each course to ten adults from 18 to 70 years old. In private, he also teaches his two 10 year old daughters the secrets of the Eastern percussions Why should the rhythm be turned? Because the wealth of the Eastern rhythms lies in this "round" sequence, measure after measure, typical of the binary rhythms which we can even find in the ternary and syncopated rhythms. Like the Indian music, it slowly seduce you and finally conquer you. As with Indian tabla (of which the darbouka is relationship), we play with the nice combination of treble sounds , the tak, and bass sounds, the doum. That requires a work on the autonomy of the hands and a lot of concentration, something the children are, according to him, very able to do. That’s why he advises to start playing rhythmic instruments from approximately 7 years old. Good teacher, Hassan doesn’t hide his knowledge, on the contrary he shares his pleasure of playing with his pupils in the courses: "I always learn, he says , and I will always learn". Moreover, if you want, he also give lessons of req, sagattes, bendir, bongo, and tabl baladi. With Hassan, the pupils will know humility. 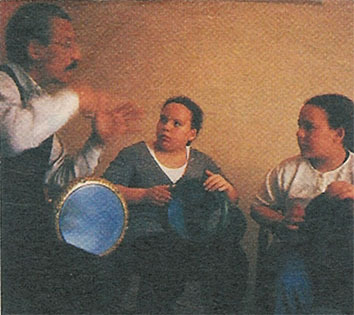 From 7 years old: courses of Eastern percussions (all the rhythmic instruments with Hassan Abdel Khalek). Special initiation for Paris Momes on Saturday the 6th of June at 11:00 AM. To learn how to play: darbouka (derbouka), req, sagattes (cymbalettes of the fingers), bendir, bongo, tabl baladi (tabl saîdi). An adult + a child: 60 FRF. 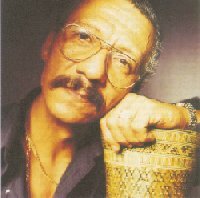 In the Center of Eastern percussions, Hassan Abdel Khalek 4, rue des Carmes 75005 Paris. You can book at these phone numbers: 01 45 84 61 85 or 06 08 99 01 06. Ask for Hassan. For your information, Courses of darbouka for children will start on the 1st wednesday of September.